Today, the main treatment for AML is chemotherapy, sometimes followed by a stem cell transplant. However, because older AML patients have a lower tolerance to intensive chemotherapy regimens, they often have a poor prognosis. In fact, many elderly patients face a higher risk of treatment–related mortality. They also face a higher risk of remission. The study, reported in the Journal of Clinical Oncology, suggests that androgen maintenance therapy could improve the outcomes of older patients dealing with these issues. Specifically, this new approach may be beneficial to older individuals or those who develop serious complications from chemotherapy and cannot tolerate intensive post-remission treatment. In most cases, AML can progress rapidly. If not treated, the disease can be fatal in a matter of months. This is why the American Cancer Society stresses the importance of starting treatment —and finding the right treatment — as soon as possible after diagnosis. This is also why finding a long–lasting method of treatment for older patients with AML is so important. Although the use of androgen maintenance therapy for treating AML is still evolving and will require further testing, this study provides hope that there may soon be a practical and long-lasting alternative to chemotherapy in treating AML among older patients. It is important that you speak with your doctor before starting any new treatments or medications. Together you can explore the best options for you and your specific needs. 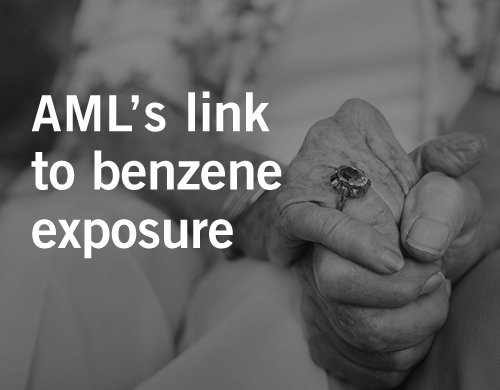 Avoiding known cancer-causing chemicals, such as benzene, can lower the risk of AML. Found in gasoline and other fuels, benzene is a component of products derived from coal and petroleum. Benzene is used in the manufacture of plastics, detergents, pesticides, and other chemicals. The International Agency for Research on Cancer (IARC) classifies benzene as “carcinogenic to humans.” The IARC is part of the World Health Organization (WHO) and one of its goals is to identify causes of cancer. The National Toxicology Program (NTP) has also classified benzene as “known to be a human carcinogen.” Benzene is also classified as a known human carcinogen by the U.S. Environmental Protection Agency (EPA). Even though federal regulations limit benzene exposure in the workplace, the highest exposures have typically been in the workplace. Industries that make or use benzene include the rubber industry, oil refineries, chemical plants, shoe manufacturers, and gasoline-related industries. If you have worked in these industries, you may have been exposed to benzene. Other people who may be exposed to benzene at work include steel workers, printers, lab technicians, gas station employees, and firefighters. There are also many environmental sources of benzene exposure. For instance, gasoline fumes, automobile exhaust, emissions from factories, and waste water from certain industries can all be sources of exposure. People can also be exposed to benzene in some foods and in contaminated drinking water. If you have been diagnosed with AML or think you may have been exposed to benzene, you should consult a doctor. The information given in this article is informational only and is not intended as medical advice to replace the expertise and judgment of your doctor. However, the lawyers at Waters Kraus & Paul have extensive experience representing clients affected by AML caused by benzene exposure in legal matters. If you or a loved one have been exposed to benzene and have been diagnosed with AML, the benzene attorneys at Waters Kraus & Paul can help you hold those responsible for your exposure accountable. To learn more about how we can assist you with a benzene lawsuit, call us at 800.226.9880.